B. 14 Feb 1821 at South Mall, Cork, Ireland Ref. D. 14 Feb 1821 at Eccles, England Ref. Daughter of Henry Turner Esq. The Rev James Pelham Pitcairn, Rural Dean, Honorary Canon of Manchester Cathedral, and late Vicar of Eccles, Lancashire, was the fourth son of Sir James Pitcairn, of that Ilk, and was born at South Mall, Cork. He lost his mother when a child; but his eldest sister filled her place, and was like a mother to him. When he grew up he thought he would like to be a civil engineer, and became a pupil of Mr Robert Stevenson of Newcastle, son of the celebrated George Stevenson, the civil engineer. Having worked at Newcastle and York for some time, Mr Pitcairn decided to take Orders and became a clergyman. Therefore, in October 1841, he matriculated at King’s College, London, and remained there one year until he came of age. In February 1842 he matriculated at Jesus College, Cambridge, and came into residence the 10th of October of the same year. In June 1846 he graduated in honours, 25th Senior Optime, and was twice prizeman of his College. On Sunday the 19th of July 1846 he was ordained Deacon at Durham by the Bishop of Chester, and afterwards appointed Curate of Stand, Lancashire. In the month of July 1847 he was ordained priest at Durham by Dr Summer, who became Archbishop of Canterbury. On resigning the curacy f Stand, he was presented with a Bible and purse of 80 guineas by the congregation. Mr Pitcairn then became Curate of Ardwick to the Rev J W Gibson, February 1848; on the 30th of May 1850 was appointed Rector of Longsight; and after being there eleven years, was given the Crown living of Eccles by Lord Chancellor Westbury in 1861. Canon Pitcairn married Emily, only daughter of Henry Turner, Esq., and Emily Adye his wife. Canon Pitcairn kept a Diary with unfailing regularity for forty years; and as the entries refer to many churches being built and consecrated in the Diocese of Manchester, to the work he did, and incidentally to his unassuming piety, it shows, better than I could his character energy, and what a busy hard working life he led. In all the entries for forty years there is not one unkind, harsh word, or criticism of others; only content and thankfulness with his lot and unostentatious goodness and piety. In 1854 Mr Pitcairn went to Ireland to see his father and sisters. He had on the whole a very pleasant lot, which was made the more so by his contented disposition. He loved his dear old church, his parish, and his schools, and took great pride in having everything kept up in proper order. His great recreation was his garden, his flowers being an unfailing interest. He collected many rare specimens, in which he took great delight. On Monday morning Canon Pitcairn called on a parishioner, and his eldest son, thinking he did not look fit to go out alone went with him. He had a slight stroke of paralysis, got gradually worse, and passed peacefully away, after ten days’ illness, to the inexpressible grief of his wife and children, on the 15th of December 1892, aged 71 years. 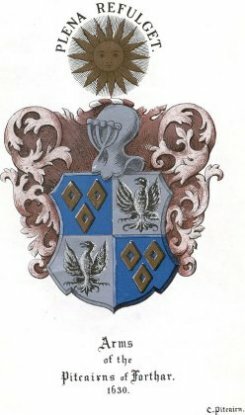 Canon Pitcairn had nine children – four sons and five daughters. Three children predeceased their father. Canon Pitcairn’s widow and children placed a brass tablet to his revered memory on the wall of the old church where he had preached for so many years.